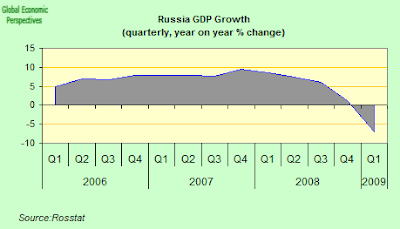 According to Deputy Economic Development Minister Andrei Klepach last week, Russia’s economy shrank by 7 percent year on year in the first quarter of 2009, a staggering turnaround for an economy which has just enjoyed eight years of solid oil-fueled growth. “These figures are worse than we expected,” Klepach said at a press conference in Kiev,citing preliminary figures. Klepach also stated that net capital outflows reached $33 billion in the first quarter of 2009, following record outflows of $130 billion in the second half of last year. The Ministers and Governors singled out the excessive focus on the supervision of individual financial market institutions and the related neglect of systemic risks as shortcomings of the current system. Does anyone think that individual regulated institutions were suffering from excessive regulatory focus in the last 10 years?Â Â If so, which one?Â RBS, Hypo, Fortis, SocGen?Â Inquiring minds would like to know. The Royal Marines have hauled down their flag in Basra; this doesn’t mark the end of the British presence in Iraq, but more the beginning of the end, or, even more accurately, the end of the beginning of the end of the end. Most of them will be out by July, leaving only a small contingent to train the Iraqi army and add tone to what would otherwise be a mere vulgar brawl. The Romanians, the only other major European troop contingent still in Iraq (about 300 strong), will be gone by July too. By August, the only European soldiers left will be trainers – either British, Romanian, or the handfuls of others operating under the Nato training mission. The news coming out of Estonia is obviously none too good at the moment. This morning we learnt that both Estonian industrial production and retail sales plunged at the most rapid rate on record in February, giving us very clear evidence that the recession is now deepening. Industrial output (adjusted for working days) fell an annual 30 percent, the biggest drop since 1995, following a 27 percent drop in January, while retail sales, excluding cars and fuel, fell 18 percent, the most since 1994. Month on month, output fell a seasonally adjusted 3.5 percent. And the situation is hardly likely to improve in the short term, since, as Danske Bank point out, all Estonia’s main partners are themselves now in deep recessions, so the possibilities of an uptick in activity – even were the economy competitive – are really pretty restricted. 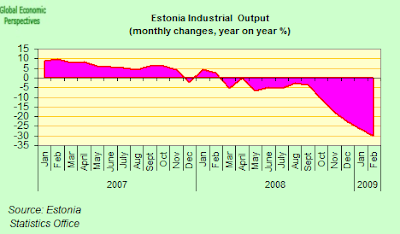 In fact, while the crisis is a general one, some countries are obviously faring far worse than others, and Estoniaâ€™s industrial production dropped the most in the entire 27-nation European Union in December and January. And even if things do start to pick up again elsewhere in 2010, it is hard to see the Estonian economy benefiting that much, since it will still be grappling with price competitiveness issues (see below).